Rinse the broccoli in cool water and trim the ends. Arrange on the baking sheet. Spray the broccoli with olive oil spray and then sprinkle liberally with salt and pepper. Bake for 13-15 minutes, until it just starts to brown. Sprinkle with Parmesan and return to the oven. Bake for an additional 2-3 minutes, until the Parmesan is melted. You’ve probably seen it in the grocery store at some point. Broccolini has long, thin stalks with the florets of broccoli at the top. But it’s not broccoli. It’s a whole different veggie altogether. 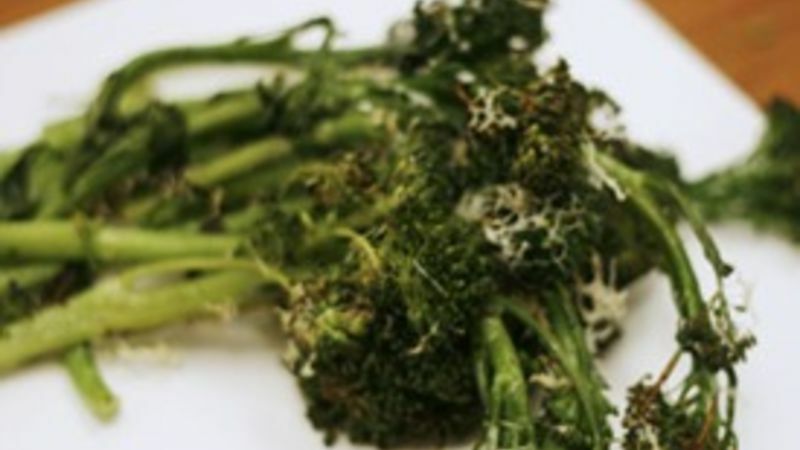 Broccolini is actually a cross between broccoli and kai-lan, also known as Chinese broccoli (though it looks nothing like broccoli – with thick greenish-bluish leaves on stalks). This hybrid veggie was created by a Japanese seed company, and has been trademarked by the US packing company, Mann. It’s also sometimes called rapini or baby broccoli. So, how do you cook this vegetable? Well, it’s delicate – sort of like asparagus (not in flavor, just in handling). So, like asparagus, it can be roasted, sautéed or steamed. It can also be grilled, if the weather permits. One of my favorite ways to make broccolini is to roast it, as in my Roasted Parmesan Broccolini. It’s an ultra-simple preparation that tastes great. And my kids love eating it. Rinse and trim the broccolini (important: the ends of broccolini can be a little woody, so trim an inch or so off before cooking), then bake it with a spray of olive oil, a sprinkle of salt and pepper, and finally a sprinkling of Parmesan that’s baked just long enough to melt onto the broccolini. And here’s a little confession for you: though it’s not the most mannerly or proper thing, my kids and I eat this broccolini with our hands. It just begs to be picked up and munched! What foods do you secretly eat with your hands?